Following on the success of No Retreat! 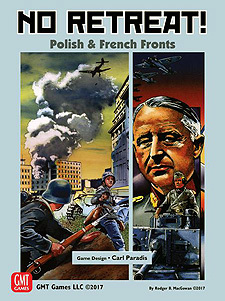 where the Russian Front of World War II beckons, and then taking the action to the African Front, game designer Carl Paradis presents the third chapter in this game series, No Retreat 3: The French & Polish Fronts. The "Phony War" ended in May of 1940 as the German Army unleashed blitzkrieg attacks into Holland, Belgium and Luxembourg in preparation for their audacious plan to invade France. Dubbed "Case Yellow" (Fall Gelb), it relied on a surprise attack with armoured forces through the Ardennes Forest that the French had deemed impenetrable. A German staff study proved otherwise, and their panzers were pushed through this broken wooded terrain with deft speed, catching the Allies by surprise with their appearance. In NR: The French & Polish Fronts., players command the Allied or German forces, operating them in accordance to one of several historical plans (represented by Plan cards). Manoeuvring forces over hexes that are approximately 18 miles across, over turns that represent 2-4 days of real time each, the vaunted No Retreat series card-assisted game systems are there to create on-map puzzles around each hex, unit and battle as the tense engagements rage back-and-forth and nothing is entirely predictable. Designer Carl Paradis has made an exhaustive study to answer the question, "Could France have staved off total defeat in 1940?" His research yields a resounding, "Yes!," and the simulation elements of NR: The French & Polish Fronts., combined with its novel gameplay elements, offer a rich and insightful presentation of this controversial military campaign that shaped the trajectory of World War II. This little-simulated battle will see many new concepts implemented into the No Retreat! game system. Given that both sides had never seen battle before and the units were mostly untried and green, a "Fog of War" game system is in use, adding much replayability to this simulation. Some intriguing "what if" hypothetical historical options are also added: Could have France intervened more effectively, the USSR acted differently? What if Czechoslovakia was never taken over by the Nazis? Poland better prepared? All these and more are yours to try out. No Retreat!